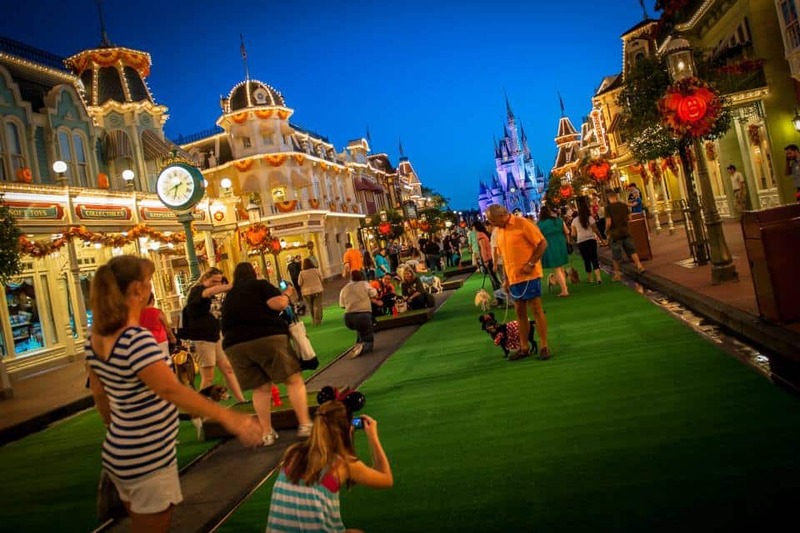 As the sun rose over the Walt Disney World Resort, 101 creatively costumed dogs and their owners walked the green carpet on Main Street, U.S.A., during our first-ever Disney Side Dog’s Day at Magic Kingdom Park. Pet dogs dressed as Disney princesses, pirates and even Cruella de Vil were featured at the tail-wagging event, which included a special doggie dance party in front of Cinderella Castle with your favorite Disney dogs like Pluto and Bolt. There was a special “Show Your Disney Side” costume contest before Disney character Goofy kicked off a first-of-it’s-kind dog walk around a portion of Magic Kingdom Park and through Cinderella Castle. 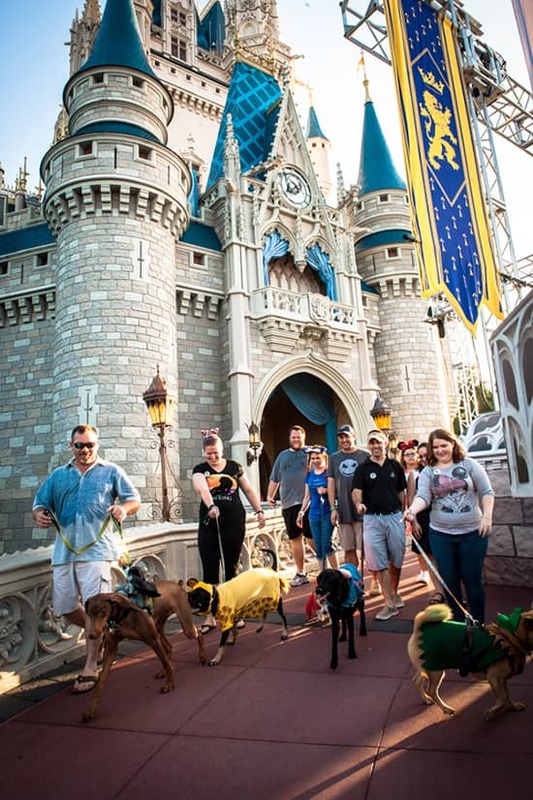 The walk was led by Lily, a Labrador-Catahoula pup with a perfect Mickey Mouse-shaped spot on her lower back originally featured on the Disney Parks Blog, as well as members of the Disney Parks Blog team. Portions of the Disney Side Dog’s Day at Magic Kingdom will be included in an Animal Planet Disney Side edition of “America’s Cutest Pet” scheduled to premiere in October. The TV special will be hosted by actor and pet lover John O’Hurley who also showed up for our event. 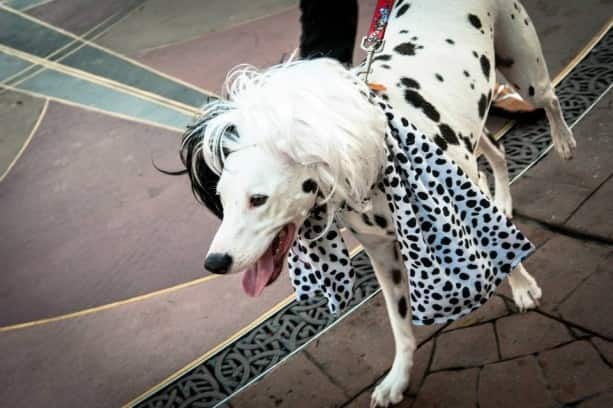 Be sure to check out our special gallery from the Disney Side Dog’s Day at Magic Kingdom Park – we had a great time and the costumes were spectacular. I have seen a lot of the pictures that were taken from this event. However, what about the pictures of the dogs in front of the attraction they were dressed like? My dog was (is) Captain Jack Sparrow and had his picture taken with some other dogs in front of Pirates. Heather – thanks and I do read but I must have pasted it or didn’t review it this one time. I will review for next year and mark my calendar to watch since we will be living in Orlando by that time. I can’t wait for November 2014 to come to leave Chicago. We were there for this event and it was amazing! My two favorite things in life: My fur-baby and Disney – and they were able to come together!!! Chanel (our princess in pink) was seen walking towards the camera in the beginning and then dancing! Thank you Disney Parks Blog for such a great event that provided great memories! Thank you DISNEY!!! We had a great time and met some new pirate friends! I hope you do it every year!!! Will we be able to get copies of the pics that Disney took of us at Pirates of the Caribbean ride? I also think it would be AWESOME if ALL STAR MOVIE resort would reserve 101 rooms that were pet friendly for guests to use all year long!!!!!! Hi! This was a great event, and I hope you do more of them so more people can taker advantage! One question — the professional photos we got done, how will we be able to get those? Only Disney would provide excellent customer service during this event!!! We had an amazing, magical experience. Thank you Disney, and to those employees who worked this event. We are forever grateful for this experience. Thanks for inviting us. We love Disney!!! WONDERFUL event! Thank you Disney. I would love to know how people got involved with this? My aunt is a dog lover, and would have loved to take her dog to this, as he doesn’t have much time left. Would have been a great memory for her. When will this happen again and how are the dogs selected? My wife and our puggle Izzy wish we could have been there!!! As Disney passholders for years, we used to take our dogs to the Disney kennels I always wanted Disney to do this, I never heard about this? Would have love to taken my kids. Anyone know if there is a place somewhere at Disney World hopefully with a couple Disney characters, where I can get a picture of the family including our dogs for a holiday card? When was this? Was it by invitation only? My hubby and I and out 2 Italian Greyhounds (mini’s) would have loved this event! We had so much fun!!! Will more pictures be posted from the event? Thank you, Ashley. We’re posting more images along with the video. So… even now, you evade The Question! Is Dippy Goof a dog??? when does this happen why was nothing said about it? Thanks Disney Parks Blog for a great morning! We had a blast!